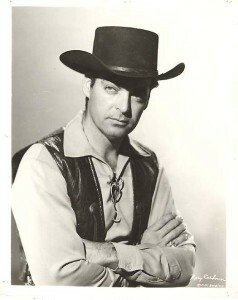 In 1957 and 1958, Rory Calhoun was juggling his career between movies and television. Not enough good movie roles were coming his way, so he took a producing role in a few westerns, working with journeyman director Ray Nazarro. The best of these was probably Apache Territory (1958), based on a story by Louis L’Amour, in color. 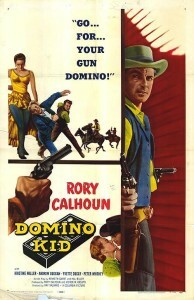 Less ambitious efforts were The Hired Gun and Domino Kid, both in 1957. Domino Kid is Court Garrand (Rory Calhoun), taking his name from the Double Six Ranch where he grew up. While he was away fighting in the Civil War, a roving band of five outlaws raided the ranch and killed his father. As the movie begins, Domino is hunting down the outlaws one by one. By the time the movie is a few minutes old, he has killed Haymes and Trancas and is looking for Ed Sandlin. He finds him in a saloon, with Sandlin sounding like he wants to make amends but really planning an ambush. Domino manages to get Sandlin and escape town, looking for number four: Sam Beal (played by an uncredited James Griffith, with his distinctive voice). Domino gets Beal but does not get away unscathed. Badly wounded, he is rumored to be dead. And he has no idea who the fifth man in the gang was. 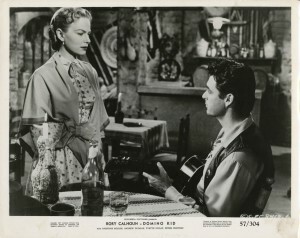 Former girlfriend Barbara (Kristine Miller) accuses Domino (Rory Calhoun) of becoming just another gunslinger–and not much of a guitar player. Back in his home town of Pradera, former friends, including girlfriend Barbara (Kristine Miller), hear of his vengeance quest with increasing disquiet. Wade Harrington (Andrew Duggan), a new banker in town, is interested in his Double Six Ranch, and hopes he’s dead. But when Barbara visits the place, she finds him there, recuperating from his wounds. He tries for a loan from Harrington but is denied. On his way home he finds Harrington’s men damming the water his ranch depends on, claiming that the stream is on public land. Domino threatens to kill Harrington if he doesn’t tear down the dam. Domino drinks more heavily in Rosita’s cantina with Juan (Eugene Iglesias), an old friend who saw the five outlaws at the time of the original crime. Domino broods about whether he’s becoming just another killer, as people seem to think. One night, an oaf in the cantina uses his quirt on Rosita and Domino decks him. Juan hauls the unconscious oaf off the premises but is captured by the oaf’s friends. As they are about to torture Juan, Domino shows up and decks him again. Juan says the oaf is the fifth man Domino’s been looking for. As Domino prepares to leave the next morning at 10, Harrington challenges him in the street with a rifle. He chooses not to respond, but we know that Harrington has already placed the oaf and some others at the site to help him. As they fire at him, Domino fires back getting a few but taking some slugs himself. As he falls, he gets the fifth man. Harrington seems to be fine. And Barbara promises to nurse Domino back to health. 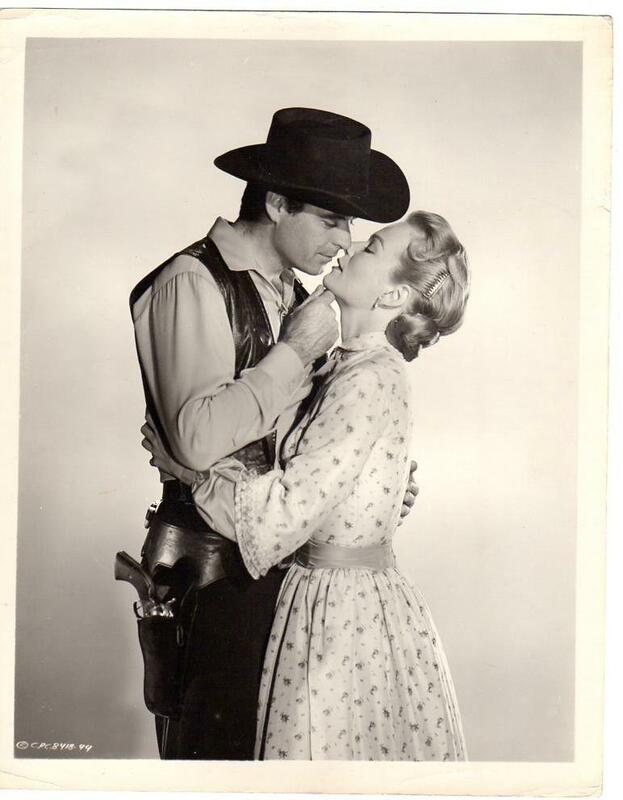 Publicity stills of a steely-eyed Rory Calhoun; and Domino (Calhoun) and Barbara (Kristine Miller) getting together. The ending is hopelessly muddled. At one point in the shoot-out, it looks like Harrington is helping Domino out, but we have no idea why, since he arranged for this attack. And several plot threads relating to the ranch are left unresolved. What about the dam? Is it on public land? What about Harrington? Is he in fact a good guy, or at least not so bad as we had thought? Is the ranch idea going to work? The Mexicans—Rosita (Yvette Duguay) and Juan (Eugene Iglesias)—are among the best characters in this one. 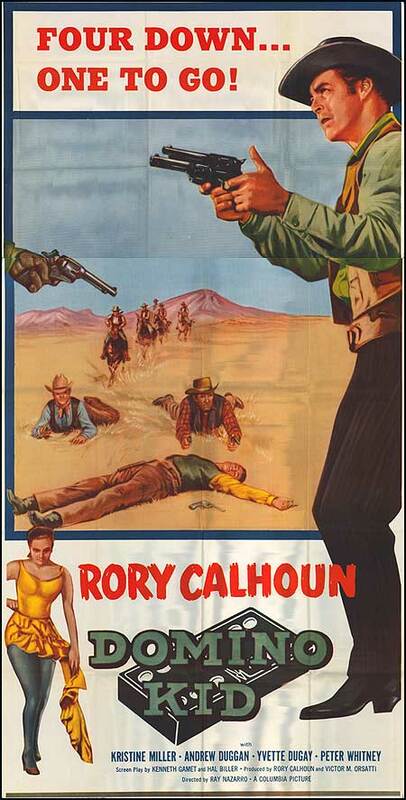 Rory Calhoun could do well in westerns, and he deserved better material, direction and writing than this. Since he was a producer, however, maybe he had only himself to blame. But the story works for a while, until it trips over its own feet. For better Rory Calhoun in protagonist roles, see Dawn at Socorro and Apache Territory. He had the best male widow’s peak in movies since Robert Taylor. This entry was posted in More Westerns and tagged Manhunts, Rory Calhoun on May 21, 2015 by Nicholas Chennault.